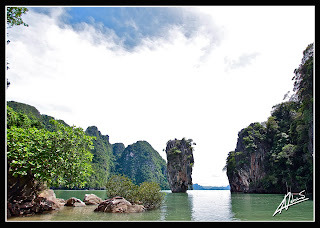 Our private tour to Phang Nga Bay Private is well designed to avoid the crowds and doing everything at your own pace. A good start to possibly avoid the tourist crowds is to leave your hotel at 7:00-7:30 depending on your hotel location. After picking you up at the hotel our driver and our guide will drive you to Phang Nga (about 1 hour) and to the scenic Sam Chong Floating Restaurant where the longtail boat leaves and where you also have a great lunch at the end of the bay tour. After jumping on the boat we head straight to James Bond Island to anticipate the crowds when it's still quiet and almost empty (sometimes schedule varies depending on tide). After that you visit Tam Lod Area where you have the optional opportunity to do about 45 minutes canoe where professional local paddlers are provided and will bring you to explore a great environment, through the caves and passageways dug by the water through the centuries in the limestone walls and in the mangroves. Later you visit the fascinating KohPanyee Sea Gypsy village built on stilts, the authentic village lays beyond the first line of restaurants and souvenir stalls and there you can see a unique lifestyle, great place. You then move to a large very interesting limestone cave full of stalactites and stalagmites, away from the usual day trip routes. You then move back to Samchong Floating Restaurant to enjoy a tasty lunch facing the scenic mangrove channel. After lunch there's one more stop at Sawan Kuha cave temple, usually a lot of monkeys just outside the entrance and Buddha statues inside, very interesting place. It depends also by your own pace but this itinerary usually ends around 14:00-15:00 in Phang Nga and then we leave the minivan available for you until 17:00 for any additional purpose like visiting waterfalls, temples, shopping, activities or whatever else you would like to do (according to weather and time available). Just discuss about additional destinations after lunch with your tour guide.